Essential Dynamics are a company founded in 2007 in New York City. 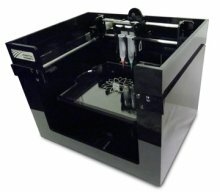 They develop and build 3D printers for the home market, and sponsor a website where visitors can create and share 3D designs. Essential Dynamics' Imagine is a syringe based 3D Printer that comes fully assembled, prints out a variety of materials, including food, chocolates, silicone, cheese, epoxy, organics, etc, and retails at around $2,995.